A big advantage to using Rye Ambulatory Surgery Center is the wide range of insurance coverage accepted. This means you should be able to keep your doctors even if you find you have to change insurance plans. We care equally about every patient regardless of the insurance provider. Rye Ambulatory Surgery Center is affiliated with White Plains and Greenwich Hospitals. If you need to be admitted to the hospital, please contact the hospital directly to determine if it and its respective staff members are participating providers in your plan. You will find below a list of health plans with which Rye Ambulatory Surgery Center is participating. This list of participating plans is being provided to you as a courtesy. We recommend that before you select a healthcare plan or make any changes to your present plan, you contact your healthcare provider. You are ultimately responsible for the selection of a healthcare plan and for understanding the benefits provided thereunder. If Rye Ambulatory Surgery Center is not a participating provider in your plan, then upon your request, Rye Ambulatory Surgery Center will be pleased to provide you with a written response that will include the amount or estimated amount you will be billed for the healthcare services being considered, absent any unforeseen circumstances that may arise whenever healthcare services are provided. In most instances, all services that the Rye Ambulatory Surgery Center-affiliated providers are arranging for will be with providers who are participating in your plan. This includes, but is not limited to, surgical assistant, radiology services, laboratory services and pathology services. However, there are some exceptions. Before selecting a provider, please call your healthcare provider to determine if a specific provider participates in your plan. Rye Ambulatory Surgery Center has an agreement with Westchester Anesthesiologists, P.C. 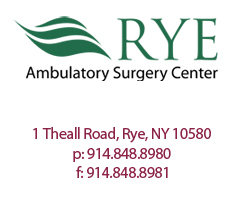 to provide anesthesia services for procedures performed at Rye Ambulatory Surgery Center. Under the terms of that agreement, they are required to participate in all the insurance plans with which Rye Ambulatory Surgery Center participates. For your convenience, you will receive a bill for these services directly from Rye Ambulatory Surgery Center. If you would like additional information about Westchester Anesthesiologists, P.C., the offices are located at 800 Westchester Avenue, Suite N511, Rye Brook, New York 10573. The telephone number is 914-428-5454. We encourage you to check with your health plan to confirm the plan imposes no special requirements for the provision of laboratory, radiology, or pathology or surgical assist. If you have additional questions or would like to request a written estimate of the amount that Rye Ambulatory Surgery Center will bill you for the healthcare services to be provided, please contact our Medical Billing Office at 914-681-3110. Excludes CompreHealth and Select Care. HMO, PPO/EPO, Indemnity, Healthy NY, Pathway and Pathway Enhanced, Child Health Plus, Medicare, Unicare, Anthem BCBS PPO. Excludes Medicare, Medicaid, Child Health Plus, Family Health Plus, CompreHealth and Select Care.